Successfully Added Android 4.4 Smart TV Box - Quad Core RK3128 CPU, 1GB RAM, 8GB Internal Memory, HDMI Port, 4x USB Ports to your Shopping Cart. Android 4.4 TV Box with RK3128 Quad Core CPU, 1GB RAM and 8GM on-board memory brings your living room to life and makes your TV truly Smart. This Android 4.4 TV box is exemplary in large part due to one of the latest processors around, the Rockchip 3128. This quad core CPU is a higher-end version of the RK3126 and features more integrated external interfaces, including CVBS, HDMI, Ethernet MAC, S/PDIF, Audio DAC, and USB so making it ideally suited to tablets and set top boxes like this Android TV box. 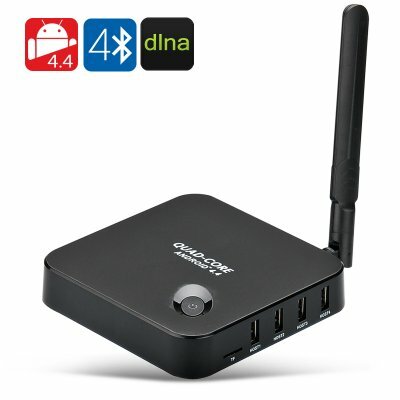 When combined with 1GB of RAM you get a great performance each and every time with this TV Box. To make connectivity easy you there are a multitude of ports including HDMI, LAN, SPDIF and four USB slots so it’s easy to connect a range of peripherals such as game controls, mice, keyboards, cameras and almost anything else that takes your fancy. With a micro SD slot you can even add up to 32GB of extra storage space so there’s more than enough room for all you media. Running the Android 4.4 operating system not only helps streamline multi tasking but brings a streamlined performance especially with regards to multitasking. It’s also pack full of features and has a range of customization options making it easy to use. As the Google Play store is pre-installed you also have over 1.3 million apps to choose from. I have now had three deliveries of these android boxes. My customers love them, I am just placing my forth order, and can only say from Hong Kong to my address in the UK in three days is exceptional. My Customers like the TV box. thinking on buying more.